If you have been following our coverage of Paranoid Android ROM’s PIE and full desktop features, then we also wanted to direct you to an app with similar qualities that can be installed outside of a ROM. It’s called LMT Launcher, and it has been around for quite some time – November 2011 to be exact. It received a pretty major update today, though, so we wanted to make sure you were all aware of it. Its set of features is quite close to the PIE from PA’s ROM that we showed you, but only requires that you be rooted in order to use it. So for those of you looking for PIE goodness while remaining stock, this is an option. In the video below, I summarize the launcher in the briefest of manners. It’s one of those apps that you could probably spend a couple of hours with, tweaking and testing, until you find a setup that you like. But the basics are this – it allows you to setup regions to swipe from to access the PIE menu (pictured above), use gestures for completing actions, and set invisible swipe areas so that you can perform tasks from anywhere. 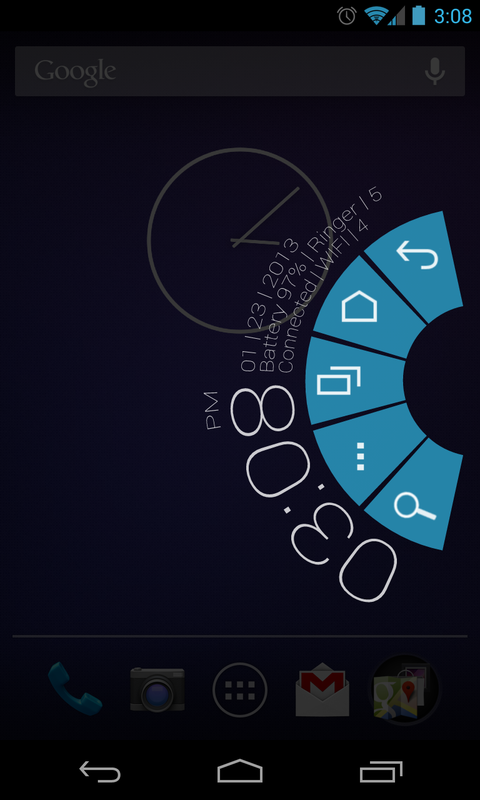 There are custom color options, buttons that can be turned to actions in the PIE menu, and so much more. If this sounds interesting enough, and it should since it received a sizable update this morning, then check out the video before jumping through to the XDA thread down below. Cheers to everyone that sent this in over the last week!